During a report on Monday’s Anderson Cooper 360 program, CNN investigative correspondent Drew Griffin presented many of the missing details about the relationship between Barack Obama and left-wing terrorist William Ayers that two earlier "Truth Squad" reports on the network on Sunday and Monday omitted. Griffin stated that despite the spin of the Obama campaign and their mainstream media supporters, "...the relationship between Obama and Ayers went much deeper, ran much longer, and was much more political than Obama said." 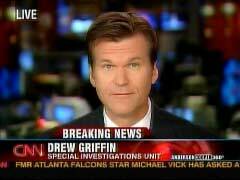 Host Anderson Cooper introduced Griffin’s report, which began 19 minutes into the 10 pm Eastern hour, as one of the CNN program’s "Keeping Them Honest" features. 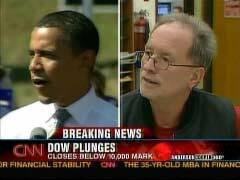 Oddly, a on-screen graphic that read "The Dow Plunges," which had nothing to do with the subject of the segment, ran during its entirety. The correspondent began by repeating Ayers and his wife Bernadine Dohrn’s background in the Weather Underground, "an anti-Vietnam War group that bombed federal buildings, including the U.S. Capitol and the Pentagon." He then gave Obama’s early characterization of his relationship with the 1960's radical, that the Democrat "confirmed... that he knew Ayers, and, when pressed, said they served on a charitable foundation board together, and Obama condemned Ayers' support of violence." Griffin then outlined how "the relationship between Obama and Ayers went much deeper, ran much longer, and was much more political than Obama said." After playing a sound bite from senior Obama campaign adviser Anita Dunn, who thought it was "just wrong, and, frankly, it's quite unfair" that Obama’s opponents were going after her candidate "because of Bill Ayers' past," the CNN correspondent introduced how Obama and Ayers’ "paths repeatedly crossed" as members of the board of the Annenberg Challenge Project, where for seven years, "Bill Ayers and Obama, among many others, worked on funding for education projects, including some experiments supported by Ayers." In another sound bite, National Review Online’s Stanley Kurtz characterized how this funding worked: "Instead of giving money directly to schools, they gave men to what they called external partners, and these external partners were often pretty radical community organizer groups." Later, Griffin detailed how Ayers and Obama were also board members for the Woods Fund, another foundation which donated money to liberal groups: "Among its recipients -- Jeremiah Wright's Trinity United Church, where Obama attended, and a children and family justice center where Ayers' wife worked." The CNN correspondent concluded his report with details about the 1995 meeting at Ayers’ house where then-Illinois State Senator Alice Palmer introduced Obama as her heir-apparent: "In 1995, months after the little-known Barack Obama became Annenberg Project chair, [Illinois] State Senator Alice Palmer introduced the young Obama as her political heir-apparent. Where was that introduction made? At the home of the '60s radicals Bill Ayers and Bernadine Dohrn." Dunn, in another sound bite, tried to portray this meeting as innocent: "A Democratic state senator organizes a meeting of her supporters at the house of another one of her supporters. What is the problem here, Drew? It is the worst kind of inference and the worst kind of politics to say that, somehow, that says something about Barack Obama." However, after his report concluded, Griffin countered that "this meeting at Bill Ayers' home has been classified in many different ways. What I can tell you from two people who were actually there is: number one, former State Senator Alice Palmer says she in no way organized this meeting. She was invited, and attended it briefly. And, Dr. Quinton Young, a retired doctor, told us this indeed was Barack Obama's political coming-out party and it was hosted by Bill Ayers." SARAH PALIN: It turns out one of his earliest supporters is a man named Bill Ayers. as 2001, he wished he had done more to stop the war. Barack Obama confirmed during a primary debate that he knew Ayers, and, when pressed, said they served on a charitable foundation board together, and Obama condemned Ayers' support of violence. But the relationship between Obama and Ayers went much deeper, ran much longer, and was much more political than Obama said. old. And that's just wrong, and, frankly, it's quite unfair. GRIFFIN: One place their paths repeatedly crossed, according to a CNN review of board minutes and other records, was Chicago's Annenberg Challenge Project, where a $50 million grant from the Annenberg Foundation matched locally-raised funds to improve schools. According to participants and project records, Bill Ayers fought to bring the Annenberg grant to Chicago. Barack Obama was recruited as its chair. For seven years, Bill Ayers and Obama, among many others, worked on funding for education projects, including some experiments supported by Ayers. Stanley Kurtz, a conservative researcher for the Ethics and Public Policy Center, has also been reviewing the recently released records of Chicago's Annenberg Challenge. STANLEY KURTZ, NATIONAL REVIEW ONLINE: Instead of giving money directly to schools, they gave men to what they called external partners, and these external partners were often pretty radical community organizer groups. GRIFFIN: And the board gave hundreds of thousands of dollars to Bill Ayers' Small Schools Project promoting alternative education, like the Peace School, with a curriculum centered around a United Nations theme, and another school where the focus was African-American studies. GRIFFIN: (on-camera): And this was directly funded by Annenberg? KURTZ: Oh, yes, and the specific job of the board of directors was to give out the money. GRIFFIN (voice-over): While continuing work on the Annenberg Challenge, Barack Obama and Bill Ayers also served together on a second charitable foundation, the Woods Fund. Among its recipients -- Jeremiah Wright's Trinity United Church, where Obama attended, and a children and family justice center where Ayers' wife worked. Ayers has strong defenders in Chicago, among them Richard Daley, the mayor, who called Ayers a valued member of the Chicago community. The city gave Ayers its Citizen of the Year award in 1997 for his work on the Annenberg Project. For Obama, the chairmanship of the $100 million Annenberg board helped vault him from South Side Chicago lawyer to political player, and that, too, has another connection to Bill Ayers. In 1995, months after the little-known Barack Obama became Annenberg Project chair, [Illinois] State Senator Alice Palmer introduced the young Obama as her political heir-apparent. Where was that introduction made? At the home of the '60s radicals Bill Ayers and Bernadine Dohrn. The Obama campaign again says it is just a coincidence. DUNN: A Democratic state senator organizes a meeting of her supporters at the house of another one of her supporters. What is the problem here, Drew? It is the worst kind of inference and the worst kind of politics to say that, somehow, that says something about Barack Obama. GRIFFIN (on-camera): Anderson, this meeting at Bill Ayers' home has been classified in many different ways. What I can tell you from two people who were actually there is: number one, former State Senator Alice Palmer says she in no way organized this meeting. She was invited, and attended it briefly. And, Dr. QuintonYoung, a retired doctor, told us this indeed was Barack Obama's political coming-out party and it was hosted by Bill Ayers. COOPER: So, Drew -- bottom line, if Obama and Ayers worked together with others to, I guess, improve schools, what exactly is the McCain/Palin camp saying is wrong with -- with this relationship, or this working relationship, or however you want to characterize it? GRIFFIN: Well, Anderson, I haven't contacted the McCain campaign on this issue. What they're saying on the stump is the same thing that Hillary Clinton brought up during the primary campaign. It is the issue of trust. You know, by raising this issue of Bill Ayers, and whether or not Barack Obama was hanging around with him, palling around with him, or just working with him -- Bill Ayers, in the '60s, had a very, very different view of the United States that many Americans did. A lot of Americans were against the Vietnam War, but not a lot of Americans formed a group and started bombing things because of it. Now, they're trying to say that that raises judgment issues on Barack Obama, which has been the tag other campaigns -- now McCain's, have been trying to peg on him ever since he started running for president. COOPER: But Barack Obama has publicly stated he does not agree with this guy, correct? GRIFFIN: Well, he has said that he does -- I forget his exact words, but he certainly deplores the -- the violence in the past. GRIFFIN: I haven't been able to ask him directly about the relationship he has or had with -- with Bill Ayers. COOPER: All right, Drew Griffin, thanks very much.